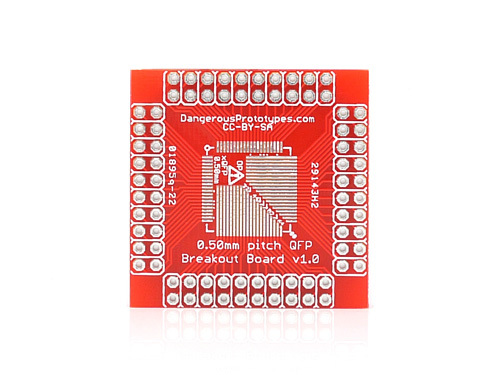 xQFP breakout boards are back in stock at Seeed Studio. These popular boards let you solder a surface mount chip and then use it with wires or breakout pins. 0.50mm is by far the most popular size. Available in 0.50mm, 0.65mm, and 0.80mm for $3. This entry was posted on Thursday, June 30th, 2011 at 6:06 am	and is filed under News. You can follow any responses to this entry through the RSS 2.0 feed. You can skip to the end and leave a response. Pinging is currently not allowed. Very cool stuff! I’d also like to have breakout boards for SOIC packages of various pitches.